modern power dressing begins with the perfect leather jacket. i'm counting the days until the temperature drops so that i can bring out my black leather jacket – the single most cherished essential in my wardrobe. after 6+ years, i still find it endlessly versatile, and the jacket has earned its cost-per-wear hundreds of times over. every fall, i get questions from readers asking where to get that perfect leather jacket. these are my two perennial picks – i've seen them in person, and the leather and fit on both are superb. first, of all the options out there now, i think the most flattering and easy to wear version is a sleek silhouette with a drape collar. i love the sharp, minimalist elegance in the Rick Owens original – it has become an iconic classic. second, a really good leather jacket doesn't come cheap. that said, i personally believe in splurging on foundations that will keep you warm. i've worn mine every year for about 3/4 of the year (fall, winter, early spring) since i bought it in 2007, so it has proven to be a very utilitarian and 'evergreen' wardrobe staple. 1. minimal design // keep it simple and streamlined – too many zippers and extras would look overly trendy and costumey. choose one in black leather – it's low maintenance and goes with everything. 2. versatility // wear with everything: jeans and boots, silk dresses and white tees, sneakers and heels...it also works as a fall and spring jacket, but it's still thin enough to work as a cardigan alternative underneath a vest or overcoat. i'll even wear mine under a trench in later fall and early spring to add a bit more warmth. 3. durability // the leather should be thick enough to be substantial and warm, but not so thick or stiff (a sign of poor quality leather) that it adds bulk. 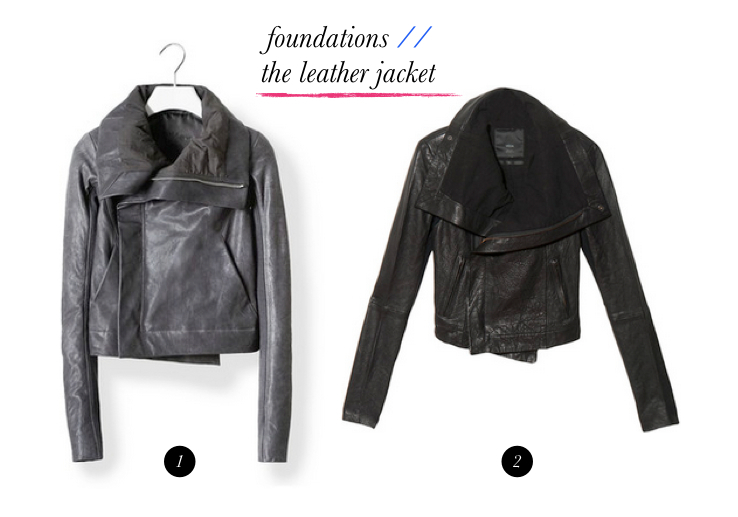 a luxe leather jacket will soften and break in with time and wear. 4. fit // it should be nicely tailored, especially in the shoulders and through the arms. the ribbed side panel on the sleeves of the RO/inspired version ensures a sleek and comfortable fit. do you have a leather jacket? how do you like to wear it? My AllSaints biker jacket practically made me famous:). There is NOTHING as good as a perfect leather jacket. That is one of Ashley O's most iconic looks. Flawless. In have a brown leathernjacket, I get to wear it once a year...at night if I'm lucky. Tropical climate. Totally agree with you about all the points you've covered. I've finally bought my holy grail RO jacket and it's incredibly flattering. The fit is like no other and it's also great as a cardigan. I think I need to buy an RO leather jacket, but I've had a few things on my wishlist that I've focused on first. It also gets quite brisk here, so I choose to wear a coat more often than not! Totally agree though, a leather jacket is definitely a wardrobe staple! I have two leather jackets but unfortunately they are less practical than the clean-lined versions here. One is an off-cream sleek version, which is quite nice except I think it would get dirty pretty quickly. The other is a black, shorter version from several years ago - so geared more for southern California weather and not east coast temperatures. I went for the RO version earlier this year and it was so worth it. It's flattering, it goes with everything, it instantly makes me feel cool, and in my climate it gets more wear than a coat. Hands down the best clothing purchase I've ever made. I completely agree. While my jacket isn't as expensive as those picks (it's a Mackage one I got on sale), at the time I was still a student and it was one of the biggest splurges I've ever made. 5 years later and it's still my most-worn jacket. The leather has just gotten better over time and, fortunately, the knit trim has held up well (although for my next jacket, I wouldn't get one with any knit trim). It's one of those pieces that I love so much, I haven't even bothered ever thinking about a replacement for it. I can see myself getting so many more years out of it (plus it has a little concealed nylon hood that zips inside the collar-perfect for those times when you get caught in a Vancouver downpour!). that sounds quite lovely! i tend to overheat easily so a shearling lining would be too much for me. :P but i might change my mind if i lived in norther europe! Sigh... the one that got away. Last fall, I tried on a leather jacket from Mango. So perfect, so soft, so RO-ish, and at a mere 200 dollars. I decided not to buy it, because as a student 200 dollars is a lot of money, and at the time I wasn't convinced that I'd be really using it enough. Alas, I haven't stopped thinking about it, and I am now convinced that it would have been a permanent stable in my wardrobe for many, many years. It's really the biggest sartorial regret of my life. Thank God, it's only clothes :) At least now I will now for sure to buy it the next time I find a similarly perfect leather jacket (if that ever happens). I scored one of the many variations of the RO jacket on sale at luisaviaroma about a year and a half ago for not much more than the Veda jacket and I LOVE it, but I will say the RO tight sleeves limit what you can pair it with. That said mine has the big collar with taffeta lining which means it goes from t-shirt to evening gown. Totally a "piece". ooh what a lucky find! the taffeta lining sounds just exquisite. I have a vintage RO-ish leather jacket that I wear occasionally, it's great and has the same shawl type collar as the RO ones, but it's too small and doesn't fully close around my bust, lol. No biggie though, it looks cooler left open. I'm considering a motorcycle one by Acne and maybe something oversized. I do feel like I 'need' one more great leather jacket. Ugh, just wrote a (way too) long comment and hit publish before I remembered to delete my url from the bottom. Sorry about that. Won't repeat myself exactly except to say that I agree that a leather jacket is a must-have staple for any wardrobe. I have two that I love (very different styles) but neither has been a real investment piece. I fantasize about one day having a RO classic and a BLK Denim biker jacket. I guess I better start saving now, ha! Yes to the leather jacket!! I have a couple but am dead set on adding a more relaxed and warmer version. I prefer to use my leather jackets as jackets and don't want to feel too constricted. A nice, warm hug from an oversized perhaps cocoon style leather jacket would be heaven for me! I lost my leather jacket just before winter started (it fell off the back of my bike) and was so sad! I got it on mega sale from banana republic when i was last in new york. Anyway, in the hunt for it's replacement, I tried on lots of other jackets by more well known companies, but the one i got in the end feels like it was made for me (it's by a melbourne company, ivy and white). i feel a little bit guilty, but i'm kind of glad i got to buy a new one. i don't feel like i settled this time around. it's such a good feeling to buy something and cherish it! Your leather jacket is flawless. I think I have the best RO in Paris story ever.